The “No Eyeglasses Policy” will go into effect November 1, 2016. 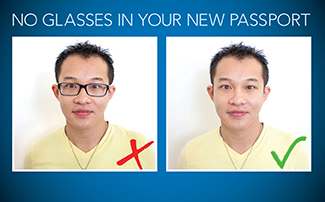 Under this policy, Consular Affairs will no longer accept photographs of visa and passport applicants wearing eyeglasses, except in rare, medically-documented circumstances. U.S. passport photos are available from the Washington Mall Studio or the Kit and Caboodle in downtown Hamilton. Bermuda (U.K.) passport photos, vending machine photographs or photos printed from a home computer do not meet the required specifications and will be rejected.